If you’ve been to a supermarket lately now that summer is in full swing, you’ve probably noticed that there are a lot of barbeque and marinating sauces to choose from. Different flavors, textures, ingredients – it can be a little overwhelming. I’ve tried quite a few brands over the years, but nothing compares to the brand I’ve just been introduced to – Stubb’s. I’ve seen the Stubb’s brand on my supermarket shelf before and I’m kicking myself for not having picked it up before. I was given four coupons for free Stubb’s product for this review. There were so many choices in the Stubb’s line – marinades, barbeque sauces, marinades and rubs. I settled on one sauce and three marinades of various flavors – Smokey Mesquite Bar-B-Q Sauce, Chicken Marinade, Pork Marinade, and Beef Marinade. 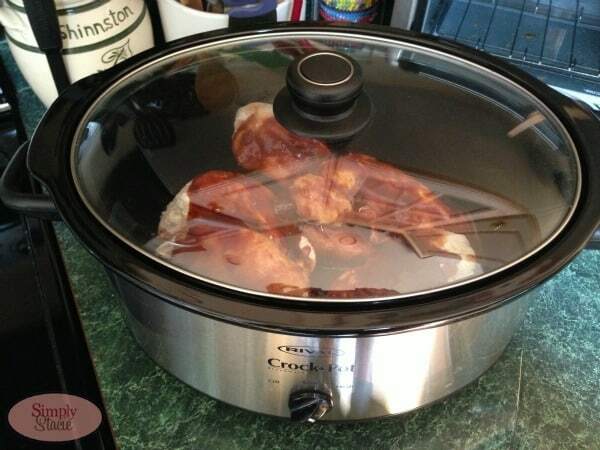 The Bar-B-Q sauce intrigued me and I was excited to try it with a slow cooker chicken recipe I had come across online. The recipe was simple: frozen chicken, the Stubb’s Bar-B-Q sauce, Italian dressing, and Worcester sauce, four hours on high in the slow cooker. The smell of the Stubb’s sauce was fantastic – I was so excited to taste it. 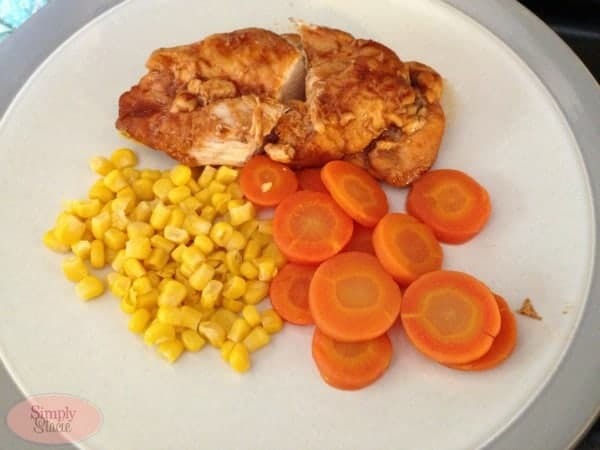 After it was done cooking, I plated some chicken with my veggies and sat down for a treat. The taste of the Stubb’s sauce was the star of the show. It gave the chicken a smokey and sweet taste and worked well with the other ingredients of the recipe. My children and husband all agreed that this sauce has a fantastic flavor. 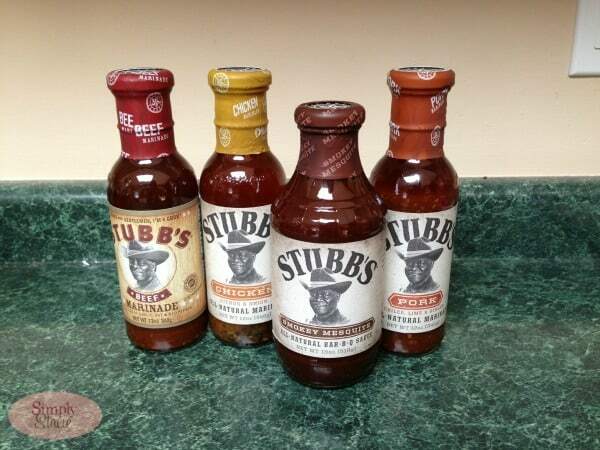 I’m looking forward to working our way through the entire Stubb’s line of sauces, rubs, and marinades! I like that they’re made with all natural ingredients and that you can find a ton of recipes on the Stubb’s site for some delicious meals. Around since 1968, Stubb’s is the creation of West Texan C.B. “Stubb” Stubblefield. After his tour of duty in the military, C.B. opened a little restaurant that gained quite a following and even landed him on Late Night with David Letterman. C.B. lives and cooks with “love and happiness” and has grown the Stubb’s brand from one sauce to six sauces, four marinades, two injectable marinades, five rubs, a moppin’ sauce and a wing sauce. The Smokey Mesquite sounds tasty!! BBQ is great. The wing sauce is what i want to try. I would love to try the Beef Marinade! Love to try them all – YUMMY! I’d like to try the Spicy BBQ sauce. I would like to try honey pecan. I would love to try the Honey Pecan, sounds delish! I would like to try any of the marinades because we BBQ a lot. I want to try the Smokey Mesquite BBQ! I would like to try the Pork Marinade. I would like to try the Stubbs Spicy barbeque sauce. Spicy BBQ sauce sounds very tasty! I’d like to try the Honey Pecan bbq sauce.